Sleeping Policemen is a fantastic indie-pop group from Hamburg, from a 4-song EP on the great folk/pop netlabel Eardrums Pop. If you like this song, check out their self-titled debut LP released in 2012 on Shining Waters / Apricot Records! "Vogelbird" by Sleeping Policemen is licensed under a Creative Commons Attribution-NonCommercial-NoDerivs 3.0 Unported License. Permissions beyond the scope of this license may be available at http://www.sleepingpolicemen.de/. 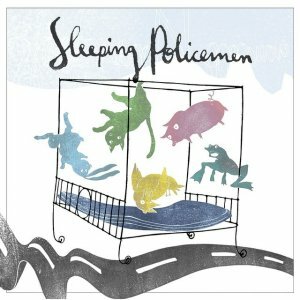 ePop028 by Sleeping Policemen is licensed under a Attribution-NonCommercial-NoDerivatives (aka Music Sharing) 3.0 International License. I am still trying to understand the licenses on this site. Is this song ok to use on a youtube video? No, it is not ok to use this song on a youtube video because the song has a Creative Commons license with the "NoDerivatives" clause. "No Derivatives" means no remixes, including videos. Hello! Thanks for listening to our tune! The song is free to download, listen to, share with your friends, put on your mixtape etc. We are actually VERY happy if you spread it and maybe even tell your friends that there are two more free songs on the digital single available via EardrumsPop and a whole album with even more songs is out in the shops on CD and vinyl (and available digitally, too, of course). If you really like this tune and want to do us and the lovely folks at EardrumsPop a favour, please go to their website (just click the link on this page) and download the ep via their bandcamp page. There you can pay for the music, too, if you want to. We promise to use the money to record more songs instead of buying dodgy things with it. If you share the song, the only thing we ask for is that you also share the information that it is our song. If we find out you are selling our song as your own work, we'll come find you and step on your head with boots on (we stole that line from the wonderful band Swell and now hope they won't want to come find us and step on our heads with boots on, by the way) or think up something else at least as nasty. If you want to use the song for commercial purposes, please note: We are not going to give it away for nothing at all. We do not care whether your budget is small, as so is ours. We have invested time, money and lots of love in our music. So, if you plan to use our song for advertising reasons, please think about a way making it mutually beneficial for both sides before contacting us. Please don't be rude nor arrogant. We know this game.